The QCS 6, 15, 30, and 65 models are able to mix more than 90% of all popular ink formulas in amounts of a 1/4 lb. or more. 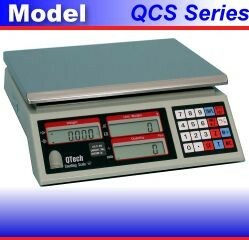 The QCS 3 with its .0001 display resolution can mix more than 96% of all popular ink formulas in amounts of a 1/4 lb. or more. The use of "Base Inks" allows for the mixing of any amount of ink with any of the QCS models. Ask us for details. Postal and Shipping weight determination.